Steel Construction is Durable and Long-Lasting. 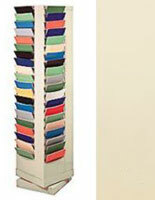 Tan Color is Able to coordinate with Many Different Settings. 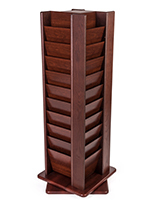 Compact Unit Displays Many Pieces in Small Amount of Area. 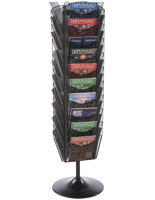 The floor standing office leaflet stand is great for waiting rooms, libraries, and retail locations too because of the many pockets it has for use. 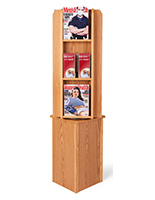 The literature display can showcase many magazine, periodicals, and papers for purchase and does so in a fairly small amount of space. 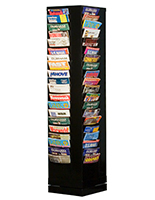 The leaflet stand with 80 pockets is a holder that will rotate so that customers and patrons can see all of the materials placed for viewing. 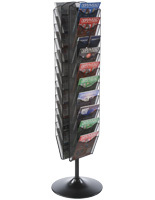 The literature displays are made of steel and are durable fixtures to last for an extended amount of time. 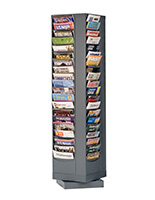 The stand has slots that are angled and long to keep magazines and papers from bowing over and having a permanent fold or crease. 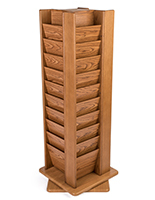 The periodical holder is shipped to customers unassembled to save on cost, but will got together quickly and without any tools needed. 14.1" x 60.8" x 14.1"